Hairstylists are often faced with two options when they have built a loyal and steady clientele base. You can stay at a commission-based salon for the security and safety of the unknown being an entrepreneur; or you can take a leap of faith, have the confidence in you and your clients to rent a chair or suite and become your own boss, make your own hours, make your own money, sell your own products, choose the services that you want to provide and make all your business decisions. 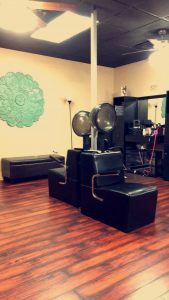 Do not worry if those locations are just not feasible for you and your clients drive to check out our Keller, Southlake or Irving locations or come take a tour at our Salon and Spa Galleria Grapevine is a short drive away. Once you see yourself working for yourself you will know that our salon and spa is where you need to be. Our suites are move-in ready and totally customizable to your liking, and we encourage you to make it your own by decorating or painting.